JACKSONVILLE, Fla. (AP) — A Florida man convicted of first-degree murder for fatally shooting a teenager in an argument over loud music outside a Jacksonville convenience store was sentenced Friday to life in prison without parole. 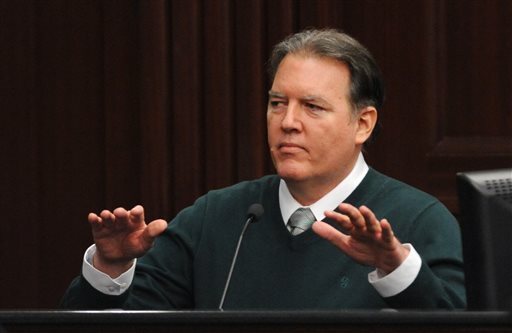 The life sentence imposed by Circuit Judge Russell Healey was mandatory for 47-year-old Michael Dunn after prosecutors decided not to seek the death penalty. Dunn was convicted of first-degree murder at a second trial in September after jurors deadlocked on the charge at his initial trial in February. Prosecutors say Dunn, who is white, fired 10 times into a sport utility vehicle carrying black teenagers in November 2012 and killed 17-year-old Jordan Davis of Marietta, Georgia. Evidence showed that Dunn, of Satellite Beach, fired the shots during a heated argument over the volume of music coming from the SUV carrying Davis and three other teenagers. Dunn was convicted of three counts of second-degree murder and sentenced to 60 years in prison in his first trial because he continued to fire into the Dodge Durango as the driver tried to flee the scene. The 60-year sentence is consecutive to the life sentence. Dunn, who testified at both trials, claimed he was acting in self-defense. Dunn told jurors that he saw Davis roll down the window and flash what he believed to be a gun after the two exchanged words. He contended that he kept firing at the fleeing SUV to make sure no one shot back at him. At Friday’s sentencing hearing, Dunn apologized to Davis’ parents. Davis’ mother, Lucia McBath said she always taught her son to love and to forgive. “Therefore, I too must be willing to forgive and so I choose to forgive you Mr. Dunn for taking my son’s life,” McBath said in court. Throughout the second trial, prosecutors portrayed Dunn as a cold-blooded killer. Dunn never called 911 after firing into the SUV, and afterward he went back to his hotel, made a drink, ordered pizza, walked his dog and went to sleep. Dunn testified that the problems started when he and his fiancee heard loud bass thumping from an SUV parked next to them after they pulled into a convenience store to buy a bottle of wine. Dunn had just come from his son’s wedding. Prosecutor John Guy said during opening statements that when Dunn pulled into the parking spot, the music from the SUV was blaring. “He looked at his girlfriend and said I hate that thug music,” Guy said.